Want an easier way to tune in Forza Motorsport 6 or Horizon 3? Sick of downloading locked tunes that don't let you change anything? Now you can create unlimited, customizable tunes with ForzaTune. 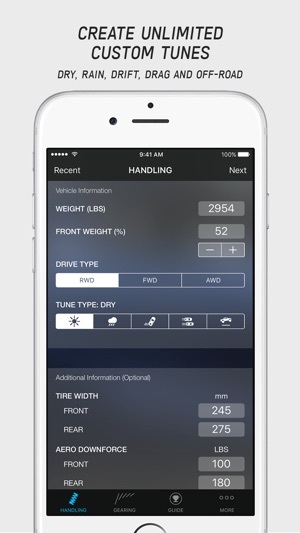 Enter your car information, select a tune type (regular, rain, drift, drag, off-road) and then get your results. 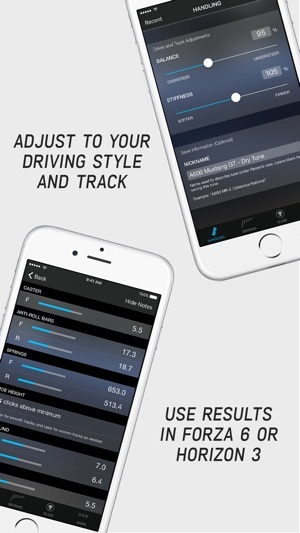 Use the sliders to tailor suspension and gearing tunes to your driving style, car or track. 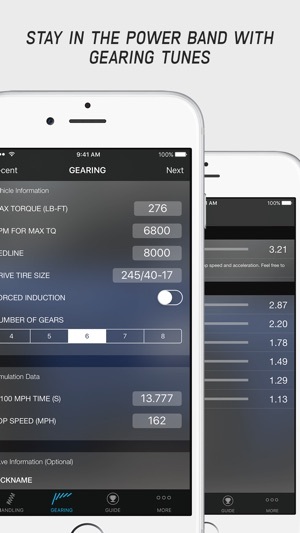 And this is more than a calculator - use the included guide to learn how suspension tuning works and be able to fine-tune your car. Download now and quickly build unlimited, unlocked tunes. WHAT DO I NEED TO USE THIS APP? - TCS, STM and ABS assists turned off and Normal or Simulation steering. - Common racing upgrades like suspension, braking, anti-roll bars. 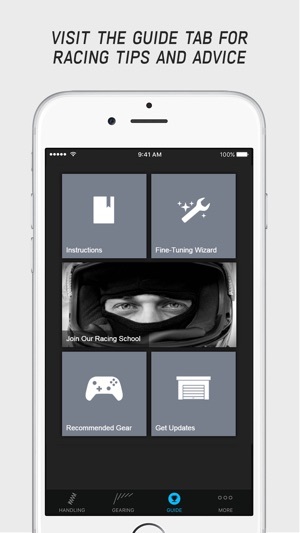 - Basic understanding of braking, turns, and throttle control. This won't make you a better driver - for learning how to drive faster see the Gallium Racing School link under the Guide tab. + Players interested in learning how to tune their own cars instead of relying on pre-built and locked setups. + Players who already know how to tune but want to save time getting a base setup. Since 2009 ForzaTune has been the go-to handling and gearing calculator for players of the Forza Motorsport video game series. The goal has always been to provide the fastest, and easiest way to create your own tunes. Version 3.1.1: Addresses a bug that showed up for some iPad users. If the app previously crashed when opening recent tunes, that should also be fixed as well. Version 3.1: ForzaTune is now updated for iOS 11 and includes several stability improvements. We've reopened our mailing list too. Now you can sign up and get the latest updates on our plans for Forza Motorsport 7. Tap the "Get Updates" tile under the Guide tab to join. 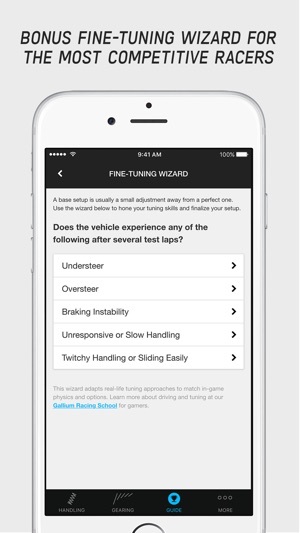 Version 3.0: Get the new drag racing and off-road tuning modes in addition to dry, rain and drifting. GREAT Foundation for Better Tuning! I really like how quick and easy it is to use this app. I put together a nice ‘57 Chevy Belair in Forza 6 today. The upgrades put its PI score at the top of Class B: 500. However, when I took it out for a shakedown test drive, I knew that I was going to have to tackle something I’ve put off for way too long: learning how to tune my cars. Luckily, Google took me straight to this app! It only took about five minutes to learn how to use it - and ten minutes later the Bel Air was putting up lap times much lower than I thought it could achieve. From now on, I’ll be keeping ForzaTune within reach every time I open Forza 6 or 7! I'm loving the added videos and tips from Gallium. I had pretty good luck tuning with Forza 5 app. Can't wait to play with suspension and gearing tunes in Forza 6. I'm still debating with myself on the expense of the Gallium racing school, $49 seems a little expensive, but I've talked myself into crazier things. Overall this app takes video game racing into a whole other realm, way beyond just going fast and turning quick. Love it wouldn't consider racing without it, makes the game for me! This app is amazing not in the sense that it will get you a perfect tune from the very start, but it gives you a good base number which you can revise. 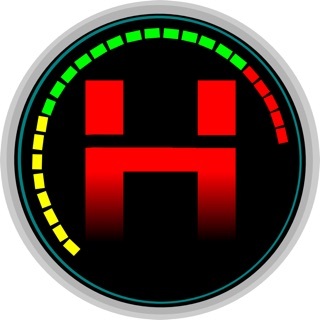 Downloading locked tunes can be great in some areas, but a good all around tune is very rare and the ability to adjust your tune to your driving style is awesome. 4 stars, only because some instructions (i.e. numbers for max torque and redline) are unclear and someone without experience may have trouble estimating them well. Overall, this is a great app.